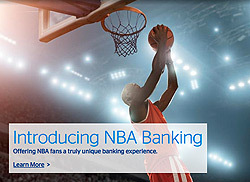 Official Bank of the NBA BBVA Compass (and NBA sponsor since 2010) is launching an NBA-branded online account called NBA Banking, part of a strategy to expand beyond the smiling states, and also promote its new integrated online banking system. The bank, which says it is aiming to be identified as "the bank of sports," is also signing NBA All-Stars Kevin Durant and James Harden to global, multiyear deals as brand ambassadors. Durant and Harden will be featured in themed advertising that will have tipped off during this weekend's NBA All-Star 2013 in Houston and run through the end of the NBA season, per the company. BBVA Compass will also go into social with a Twitter hashtag (#Realfan), intended to encourage fans to post photos to Instagram and Twitter to display their "fandom" and promote the bank’s first national product. The financial institution said, in a release, that the new NBA-branded Checking and Savings accounts are the first products built on the bank’s new digital banking platform. NBA Banking accounts must be opened online and can be maintained online and with a smartphone using the bank’s mobile app. The latter allows eligible users to upload a photo of a check to make a deposit. The company says account membership gives consumers access to its Allpoint nationwide, surcharge-free, ATM network. Thus users of the NBA account can do transactions without heading into a branch. There is also a content play where customers can view game scores and headlines on the online account interface, plus check schedules and scores via mobile devices. A promotional game lets customers vie to earn NBA merchandise by processing transactions online. The bank offers an example: three qualifying online bill payments from an NBA Checking account within a 90-day period garners a $100 NBAstore.com electronic gift card. A branded debit card is also available, and BBVA Compass customers who sign on to the program can get a team logo on their card. Last year, the bank grabbed title sponsorship of the stadium where the Houston Dynamo soccer team plays, and also hosts the NCAA football BBVA Compass Bowl.